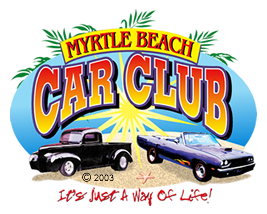 The Myrtle Beach Car Club has the ultimate listing of Car Shows, Cruise-Ins, Car Club Meetings, Auto Fairs and other Car Events for all local car clubs. Meet at HGTC Parking Lot, kick off 12 noon Cruise down Ocean Blvd to end. 9650 Scipio Lane South Strand Rec. Ctr. between 17th Ave. S and 15th Ave S.